Pokello Nare and Elikeem Kumordzie. 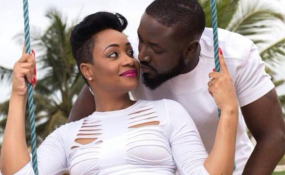 The three-year marriage between socialite Pokelo Nare and her Ghanaian husband Elikem Kumordzie is on the verge of collapse after the latter filed for divorce last week. Elikem, a fashion designer, has offered to pay $500 monthly for the upkeep of their minor child. The two met in the Big Brother Africa house in 2013 and got engaged in 2014. Their union was solemnised in September 2015 in Harare. Last week Elikem instructed his lawyers, Mahuni Gidiri Law Chambers, to issue out summons for divorce. He wants Pokelo to be awarded custody of the child with him contributing $500 monthly towards upkeep. The couple has been on separation since September last year. "They have not stayed together as husband and wife for the past one year since September 2017 and such is regarded by the plaintiff to be incompatible with the continuation of a normal marriage relationship. "As a result plaintiff has lost love and affection to the extent that there are no prospects for reconciliation due to irretrievable differences between the parties," reads part of the plaintiff's declaration.